Do you know the kinds of pain signs cats and dogs give when they’re hurting? If the answer is “No,” you’re not the only one. And sadly, many people (a few vets included) still don’t know that current animal pain management studies prove animals feel pain similarly to humans. 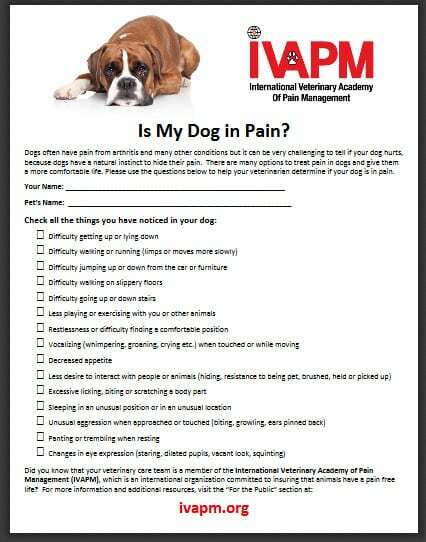 This is why each September the International Veterinary Academy of Pain Management works extra hard to get the word out through Animal Pain Awareness Month. Does your Tripawd show any of these pain signs? Panting or trembling when resting. Excessive licking, biting or scratching a body part. Changes in eye expression (staring, dilated pupils, vacant look, squinting). Dogs and cats can’t tell us they’re in pain. Their inborn survival instinct is what keeps them from showing it — even during amputation surgery recovery! But if your inner voice is telling you that something is wrong, listen to it. Whether your cat or dog is in amputation recovery or long past it, don’t wait until their pain is so bad it’s obvious. By then, an animal is likely experiencing horrific pain that would put any human in the hospital. 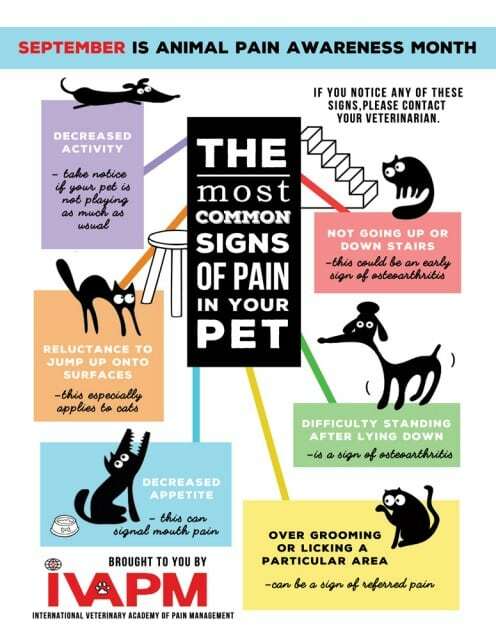 Download these handy Cat and Dog Pain Signs Checklists. Then call your vet asap to discuss what you’re seeing. Please ask your vet for a clear action plan for treating the pain. Sometimes all it takes is rest and medication. Other times managing animal pain may require additional support from a certified animal rehabilitation therapist. If you’re not seeing improvement in your pet after following your vet’s plan, we urge you to discuss this with them. 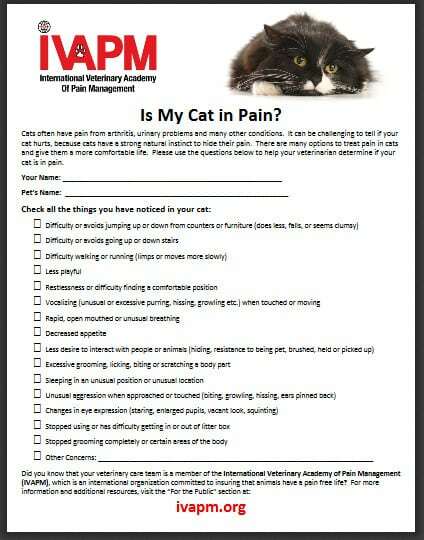 If the vet seems stumped, ask for a referral to a veterinary pain management specialist near you. Excellent vets won’t be insulted you did, and will often give you a referral before you even ask for one. We encourage you to visit a members of the International Veterinary Academy of Pain Management. These vets know more than most about animal pain because they’re on the leading edge of pain management studies and treatments. Visit one like Dr. Mike Petty and your Tripawd will be feeling good again in no time! Dog Bone Fungal Infection or Cancer Tumor? Sheba’s Story. Thanks for posting this! Milhouse has a ton of anxiety and between thunderstorms and fireworks here, I’ve had a hard time trying to figure out nerves vs. pain. I think it’s nerves!